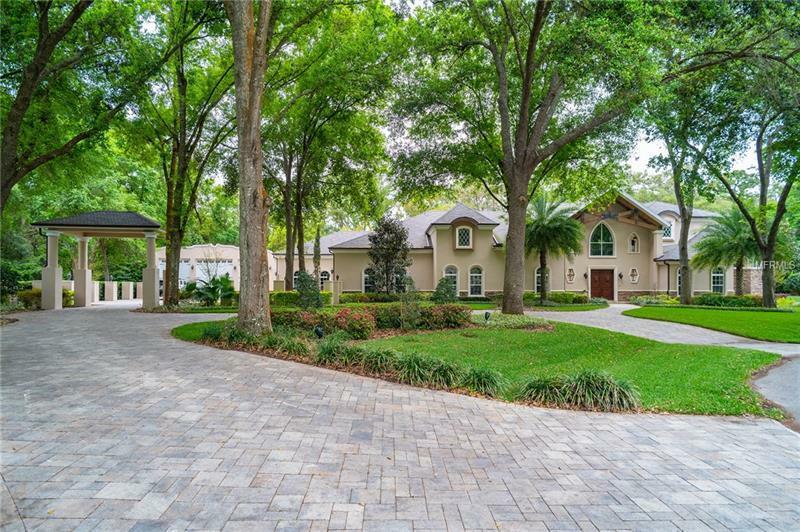 16332 Emerald Cove, Lutz, FL.| MLS# T3163340 | Westchase Real Estate - Westchase FL Homes For Sale - Westchase Local Experts. This one of a kind custom home was developed and designed to set it apart from all other unique homes. The location is perfect close to everything but tucked away in your own private enclave. The entrance is highlighted with 7200 linear feet of maple wood base which flow through the great room and above the pool area. The great room has hand selected Tennessee Slate Floor with 27-foot ceilings the dramatic room opens to the kitchen and bonus room. The kitchen has everything expected with professional Thermador stainless steel appliances double islands and bonus pot filler faucet. The master bedroom located on the ground floor has a dramatic double doorway entrance complete with gas fire place and venetian plaster. Custom forged steel railings flank the stairs and large loft area. Along with the third en suite bedroom. The pool is salt treated with two water falls custom lighting can be changed to any color. The garage area consists of a 3-car garage along with an 8 car garage for the car enthusiasts. The detached boat/RV has 13' ceilings and has its own 100-amp panel. The house has a a Generac generator with a 1000 gallon tank. If you are looking for Location Privacy no CDD a home where you have room for your family and everything else schedule a showing today.